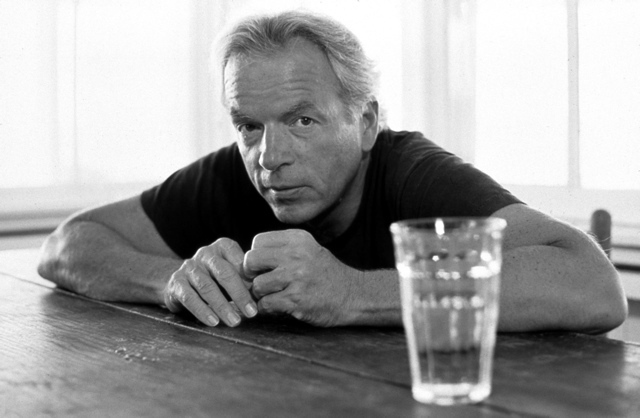 Spalding Gray (1941-2004) was an actor and a writer, best known for his monologues, wherein he told humorous, poignant, personal stories based on his life, mostly while sitting at a table, sipping from a glass of water, talking into a microphone. He described his writing as “poetic journalism,” in that he did relate what had happened, but with a bit of editing or embellishment – as seemed fit. Spalding achieved fame with his monologue SWIMMING TO CAMBODIA, made into a film by Jonathan Demme in 1987. The success of that film boosted his career, leading to more film acting roles, which also took him away from his work with The Wooster Group, an experimental theatre company in New York. But he kept doing his monologues, MONSTER IN A BOX, GRAY’S ANATOMY, IT’S A SLIPPERY SLOPE, MORNING, NOON AND NIGHT, and others — many of which have been published, the last being LIFE INTERRUPTED. In 2001, on a trip to Ireland, the vehicle he was riding in was hit by a truck, and Spalding suffered multiple injuries, including a fractured skull, which caused brain damage, and depression. While undergoing treatment, he kept working on new material, performing bits of it in-progress. Along the way, he found he couldn’t perform like he used to. His depression led to thoughts of suicide, including attempts. One night in January 2004, he succeeded, jumping off the Staten Island Ferry into the East River. His body was found two months later. A few years after Spalding died, his widow, Kathleen Russo, and theatre director Lucy Sexton, assembled a script made of excerpts from his monologues, his journals, and letters. The texts were organized into five topics that were important to Spalding: Love, Family, Adventure, Journals, and Career, performed in our production by Isabelle Kralj, John Kishline, Mark Anderson, Deborah Clifton, and Jill Anna Ponasik. Gigante’s production of SPALDING GRAY: STORIES LEFT TO TELL takes place November 15-18, 2018 at Kenilworth 508 Theatre (1925 E Kenilworth Place). Performances are Thursday, Friday and Saturday at 7:30, Sunday at 2:00. On Friday and Sunday, there will be a post-show talkback about the production, but also about mental health, brain injury and suicide, with local psychologists. We want to acknowledge this difficult part of the story, but also celebrate the bright parts of Spalding’s life. Theatre Gigante opens its 31st Season with the telling of the life of Spalding Gray, in his words. SPALDING GRAY: STORIES LEFT TO TELL is a delightful, moving tribute to the life and work of this acclaimed and groundbreaking writer/monologist/actor. In this production, Journals will be played by Deborah Clifton, Adventure by Mark Anderson, Love by Isabelle Kralj, Family by John Kishline and Career by Jill Anna Ponasik. SPALDING GRAY: STORIES LEFT TO TELL premiered Off Broadway in New York City to critical acclaim, in the year 2007. When it closed later that year, Theatre Gigante received the rights to perform it. It is with great pleasure that Gigante Artistic Directors Kralj and Anderson – who directed this production – open Gigante’s 31st Season with this exquisite found poetry, reshaped into a poignant and heart warming new theatrical piece. Spalding Gray, who died in 2004, was best known for his monologues, SWIMMING TO CAMBODIA, MONSTER IN A BOX (performed in Milwaukee in 1992), GRAY’S ANATOMY, IT’S A SLIPPERY SLOPE, and MORNING, NOON AND NIGHT – several of which were made into films. In addition to his career as a solo performer, he also acted in theater, film and television, and was a founding member of The Wooster Group, a renowned experimental theatre company in New York. Now in its 31st year, Theatre Gigante enlivens the local performance scene with its unique style of theater. Gigante brings original theater to the stage and has a strong history of dynamic collaborations with locally, nationally, and internationally known musicians, visual artists, composers, and performers. Besides Milwaukee, it has appeared in Chicago, NYC, Boston, North Carolina, Iowa, Michigan, Kohler, and Slovenia, EU. The theatre of big ideas, critically-acclaimed Theatre Gigante is exciting, challenging, and fresh. The Artistic Directors Isabelle Kralj and Mark Anderson are first and foremost storytellers, and they use their eclectic backgrounds to bring many styles and genres to their finished products. Their work has an innovative signature style, combining and seamlessly flowing back and forth between text, dialogue, movement, dance, music, and, at times, video. Apart, and together, they have created over 60 theater pieces. ISABELLE KRALJ is the Founder and Artistic co-Director of Theatre Gigante. She has an MFA in Dance, and has performed with Milwaukee Ballet and the Slovenian National Theater Ballet, among others; directed theater for Gigante, First Stage Milwaukee, Theatre X, and Theatre for Young Audiences and a gazillion Gigante productions; and choreographed for the National Ballet Artists of Slovenia, and just about all the local arts organizations including Milwaukee Symphony Orchestra, Florentine Opera, Milwaukee Repertory Theatre, and First Stage Milwaukee. MARK ANDERSON, Artistic co-Director of Theatre Gigante, has been writing and performing monologues, plays and performance art pieces, for forty years, mostly in Milwaukee, and elsewhere in the U.S., from Seattle to LA, to Houston, New York City and Grinnell, Iowa – where much of this began. In 1996, he began working with Isabelle, co-creating IT’S A WONDERFUL LIFE, and since then they‘ve written, developed and produced loads of productions for Gigante. A Gigante regular, JOHN KISHLINE has been an actor, director, playwright and designer in theatre for 41 years. He has performed nationally and internationally, has written 11 plays and helped create at least 30 more, was a founding member of Theatre X, and has performed for Next Act Theatre, the Milwaukee Rep., Chamber Theatre, First Stage and others; also, the Madison Rep., Goodman Theatre, Seanachai Theatre and Chicago Shakespeare Project. A frequent performer with Theatre Gigante, DEBORAH CLIFTON was a part of Theatre X for decades and has also performed regionally at Milwaukee Shakespeare, First Stage, Milwaukee Rep, Chamber Theatre, Next Act Theatre, Madison Rep, The Goodman Theatre-Chicago and Chicago Shakespeare. Appearing for the first time with Theatre Gigante, JILL ANNA PONASIK is the Producing Artistic Director of Milwaukee Opera Theatre and the Artistic Associate of Skylight Music Theatre. As a performer, she has appeared in productions with Nautilus Music-Theater, Theatre de la Jeune Lune, St Paul Chamber Orchestra, Minnesota Opera, Skylight Music Theatre, VocalEssence, Theatre Latte Da, Skylark Opera, Ohio Light Opera, Bronx Opera, New Dramatists, Alchemist Theatre, and Milwaukee Opera Theatre among others. Jill Anna holds degrees from the University of Minnesota and the Rice University Shepherd School of Music. *Both post-show talkbacks will include a discussion on brain trauma and how it can lead to depression and even suicide, which is the case with Spalding Gray and his tragic death.